I have a Grand Junction 5th wheel and the galley water in the sink will not drain. The control panel that tells me the levels on all tanks says that it is full. I am hooked up to city sewage and I have emptied the black and grey tanks and it still doesn't drain, I don’t know if there is a separate valve to empty it or not. Water still runs but no drainage. ANSWER: Hi Jimmy, based on what you have described, I am fairly certain that your holding tanks have emptied properly and are not the cause of your sink problems. RV's are fairly notorious for giving false holding tank level readings. The probe sensors in the holding tanks are probably dirty. You can use some Holding Tank Probe Cleaner to get the gunk off of the probes and they will hopefully start giving accurate readings again. 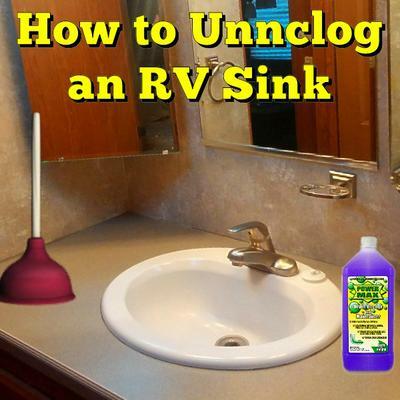 Just like the sinks in your house the sinks in your RV can get clogged. In all likelihood the P-Trap in your sink is clogged with grease, hair, etc. and not allowing the water to drain into the holding tank. You have several options to clear out the P-Trap on your sink. 1. You could try to use a bathroom plunger to see if you can move the clog out of the P-Trap and into the holding tank. 2. 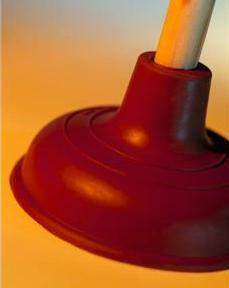 If the plunger does not work you can use some drain cleaner that is safe for plastic pipes. You should use some Eco-Friendly type of drain cleaner as you will end up dumping it into the sewer system. 3. If all else fails you will end up having to disconnect the P-Trap from your sink and cleaning it out manually. This job is actually very simple, but it can be messy. You are going to need a bucket to catch the water when you remove the P-Trap. You should also wear some rubber gloves when doing this especially if you have used drain cleaner in the sink. Below is a short video that shows you how to perform this job. Even though the video is for a house sink, all the steps are still the same. I hope this helps you resolve your sink draining issue. There are cheap plastic snake/snags that I keep under at least one sink in our rig. Another alternative before opening the J trap is trying a wet/dry shop vac. I HAVE A 2001 MONTANA KEYSTONE 5TH WHEEL BATHROOM AND SHOWER ALL DRAIN FINE THE KITCHEN WAS DRAINING FINE UNTIL I FILLED BOTH SIDES TO DO DISHES NOW EITHER SIDE WONT DRAIN I HAVE PLUNGED THE SINK AND WHEN I PLUNGE ONE SIDE IT DRAINS WHEN I STOP THEY BOTH FILL UP AGAIN I HAVE ALSO COMPLETELY DISCONNECTED THE PIPES AND CLEANED OUT AND WATER FLOWS THROUGH THE PIPES GOOD PUT IT BACK TOGETHER AND THEY SILL WONT DRAIN. Note from RVing Al: Based on what you have described, it sounds like the Air Admittance Valve (pictured Below) under your sink is not opening up and allowing your sink to drain. Take a look at the answer I gave to Sewer Smell from Vent under RV Sink. You should replace the Air Admittance Valve and your sink should start flowing again. I have a 94 Alfa 5th wheel with same problem. It worked fine when I drained my first tank mixed with bleach as it had sat all winter. The second rinse to get residue out is where I have my problem. Have checked the Ptrap, clear. I was thinking cause w got some cold water maybe it froze but had elec greater going all night and now gave put antifreeze in and nothing. Can't find any type of third tank. Any suggestions? It's quite possible your galley tank has its own valve, I have a Grand Junction and my specs show three 48 gallon gray water tanks and a black water tank. I have three T handle valves, Black Gray and Galley. If I could find a date when you question was posted this info may not be needed still. Hope you get it worked out. How do you see if your unit has a third tank?? W e are renting a 1997 holiday rambler alumna lite fifth wheel and the under neath is all enclosed. Trying to find specs on it but unable to. Any help would be greatly appreciated. We have tried everything you suggested and it is still clogged solid. Any more ideas?? We have a totally different RV but our experience is because the RV uses so much less water, the sinks are really prone to grease plug. I try to dump a kettle of boiling water with a good dishsoap down it at least once a week. That seems to help a lot. i to have a grand junction and it does have two drains one just for galley sink. You might give the unit a thorough check over too. Some campers have a 3rd tank, and you may not have it opened to drain. A quick check of your system may reveal a third tank that only holds kitchen sink water.